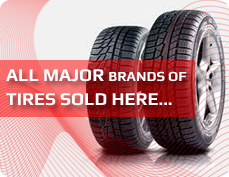 A&J Exhaust and Tire Center, LLC is your go-to source for all name brand tires in Wooster. Regardless of whether you drive a car, a van, or a truck, our tire experts can find you the best tires for your local road conditions and your individual driving style – all at the best price! We won't push a particular set of tires; we'll help you make an informed purchase. Call A&J Exhaust and Tire Center, LLC and let our tire professionals do what they do best. Thank you for considering us for all your vehicle repairs and tire services. We started A&J Exhaust and Tire Center, LLC nearly 14 years ago when my brother (Joe Mast) and I needed to find work... 14 years later we have grown to employ ten full time employees and are proud to say that we offer quality auto repair and tire service at an affordable price. Here at A&J Exhaust and Tire Center, LLC we offer our customers satisfaction, respect, and honest services. When our customers refer us to their friends and family, we see that as the best compliment to our business and our practices. We're pleased to announce we are a direct distributor of Mastercraft, Michelin, BF Goodrich, and Uniroyal tires, which allow us to offer warranty repairs at both locations. Please feel free to stop in and let us give you a quote on getting your vehicle ready for the next season.